As you might expect, one of the greatest unsolved mysteries of ancient times is the glorious Pyramids of Giza near Cairo. Somewhere far away in the secluded desert, prepare to be amazed as you can see the Great Pyramid of Khufu – the last standing ancient wonder of the world. Egyptian pyramids are looming in front of you from the Giza street while approaching them. It comes as no surprise that visiting the Pyramids of Giza in Egypt are on many people’s bucket lists. Who Built the Egyptian Pyramids of Giza? How were the pyramids built? The Pyramids date back to 2560 BC, and were ordered by the second ruler of the Fourth Dynasty, Pharaoh Khufu. For a very long time, they were believed to be built either by aliens or Jewish slaves. However, in 2010 a tourist riding a camel around the site stumbled upon some uncovered tombs that turned out to be tombs of builders who while building the great pyramids. Archeologists agreed that if they were slaves they would never be buried in such close proximity to the actual tomb. All of these workers were actually local highly-skilled Egyptians who lived in the villages nearby, working under Khufu’s supervision. 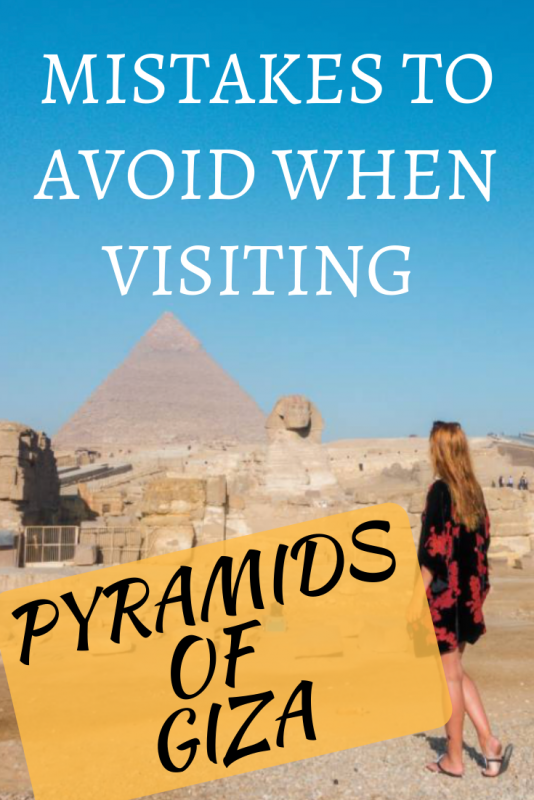 If you’re visiting the Pyramids for the first time, it’s important to be prepared and know more than you need than regret you knew something after your visit. Don’t Forget to See the Ship! Big tour buses drive in and stop right by the pyramids, but as a solo explorer, you’ll have to walk to them from the entrance. It’s not far (about an 8-minute walk) and you can surely walk around on your own without having to rent a camel or a horse. The best view of the Pyramids is from the sand dunes and whether you can walk there on foot or not depends on the mood of the guards. Not everyone is up for walking up in the sand for a while. I’m very glad I paid a few bucks ($7) for a horse. If you don’t want to rent anything, smile and politely decline. You can choose between a horse ride and a camel ride. I find camels quite uncomfortable especially getting on and off to take photos, so I suggest a horse. But it is up to you. The Pyramids are located in Giza, the third largest city in Egypt. Giza is set on the west bank of the River Nile about 10 miles away from Cairo. 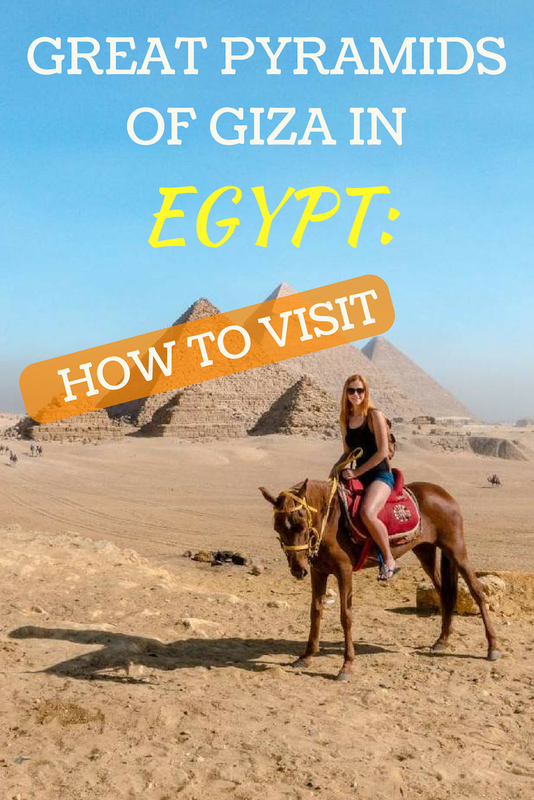 If you are staying in a hotel in the city of Cairo you’re looking into about an hour taxi drive, but you can also stay in a hotel in Giza and enjoy the view of the pyramids in the evening. My personal recommendation is to stay the night at one of the hotels in front of the pyramids (I suggest Panorama Pyramids Inn!). The undisturbed view you can wake up to in the morning is unbeatable and breakfast they serve is absolutely fantastic. If you stay in a nearby you can simply walk up to the main entrance to the site. Once you enter the site, you can either walk or get a horse or camel to ride around the pyramids and nearby desert. Otherwise, if staying in downtown Cairo, Uber works well and it’s ridiculously cheap. It will save you from haggling with taxi drivers. I paid about $3.50 for a ride from the pyramids to the Egyptian Museum. If you want to visit on a short layover, you can either grab a taxi at the airport or sign up for one of the organized tours if you don’t feel comfortable exploring on your own. The site opens every day between 8 am and 5 am from October to March, and 7 am to 7 pm every day between April and September. Most tour buses arrive around 9:30 – 10 am, so if you want to experience the site when it’s less busy. Yes, you can. But it’s not as exciting as getting inside the tombs at the Valley of the Kings. Most guides will tell you that you need to pay extra to get inside the pyramids, but it’s only partially true. There is one pyramid that’s included in your ticket price. There are three pyramids of the Queens of Cheops and you can go inside the one in the middle for free. Khufu’s Pyramid costs another 100 LE and Khafree’s Pyramid costs 20 LE, but trust me – they all look the same inside. There are no mummies inside since they were all moved to the Egyptian Museum that I highly recommend on visiting as well. A policeman on a camel approached me and offered me to climb the pyramid. He said that I seem nice and I’m the first on the site in the morning, so why not. I thought he was joking or wanted a tip, but he was just being nice. In fact, he encouraged me to climb higher. I did and the view was awesome. It turned out that in the past people were able to climb the pyramids freely. Now climbing to the top of Khufu is illegal and they don’t issue permits. However, they pick and choose which tourists can climb a few blocks of the Pyramid of Khafre and others. If you start climbing on your own they’ll yell at you and you might even get arrested. While in Giza the Sphinx, said to have been made in the image of Pharaoh Khafre guarding the Pharaoh’s pyramid, is another must-visit. Did you know that the missing nose of this magnificent monument is said to have been blown off by a cannon fired by Napoleon Bonaparte? There are two spots to see the Sphinx, but most tourists have to go to the side through a weird structure that I still don’t know the purpose of. They’ll check your tickets to ensure that you paid the entrance fee to the pyramid complex. From this angle you’ll experience the side of the Sphinx, but not the front. Every night there is an evening show at the pyramids. The show hasn’t changed for over 20 years, so while it feels like out of James Bond movie. If you’re staying at a nearby hotel (I highly recommend Panorama Pyramids Inn!) you can watch it from the rooftop. I still think that the show at Karnak in Luxor is more entertaining, but you might as well see both and decide for yourself. The most important thing to consider is suitable footwear if you’re planning on getting inside the pyramids. That said, I’d also advise against wearing flowy dresses for the same reason. Since the Pyramids were my last stop in Egypt I ran out of clean clothes and wore shorts and covered my tank top with a cover-up. I had no issues whatsoever, and in fact, I removed the cover-up halfway through the trip after my horse guide told me that it’s totally fine. Before you assume – no, he wasn’t staring at me, he actually couldn’t care less. Therefore my tip is: dress in layers and feel out the situation as I obviously recommend covering up in rural area and mosques. I wish I had a hat with me, as I totally sunburnt my head. It’s also nice to have a cooling bandana with you if you get hot and sweaty easily. Ship at the pyramids? Once you’re ready to leave the pyramids you’ll notice a structure that contains a ship that brought the stones to build the pyramids. Solo Female Traveling to Egypt – Is It Safe? Any questions about visiting the great ancient pyramids of Giza? Let me know in the comments below!